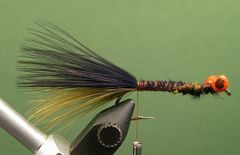 This Soft-Hackle Bi-Bugger is intended to represent a favorite food of the Smallmouth Bass - the Crayfish. Eyes Lead Barbell 1/36th or 1/50th oz. 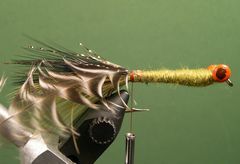 This fly is my version of Rich Osthoff's Lead Eye - Soft-Hackle Buggers. He says that the fly is nose heavy so it sinks quickly in currents and lakes. He likes it for Smallmouth Bass because you can "hop" it on the retrieve and the lead eyes make it ride hook point up. I use 1/36th oz. lead eyes on the size 4 fly and 1/50th oz. eyes on size 6 and 8 flies. As the lure's name implies, soft feathers from a hen cape are used in the tying process. Don't substitute. Find soft webby hen necks for the job. I paint my barbell eyes. 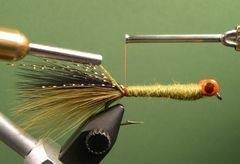 The eyes used in the tying tutorial are orange with a brown pupil but you can use red with black pupil barbell eyes which can be found in most fly shops. Because of the lead eyes, the Bi-Bugger plummets swiftly. In still water, let it sink to the desired depth and retrieve it with short strips. In moving water, let it sink and "hop" it along the stream bottom to represent a fleeing crayfish. If you're not hooking fish you may want to fish the fly under a strike indicator to detect light takes. It's also a good idea to attach the fly to the leader with a loop knot like the Duncan Knot. If you're not familiar with open loop knots, click on the "Warmwater Knots" page. Start the thread slightly behind the hook's eye and lay down a base of thread back to the hook's bend. Attach the barbell eyes at the front of the hook with figure-eight wraps. You may want to add a drop of Zap-A-Gap to make sure that the eyes are locked in place. 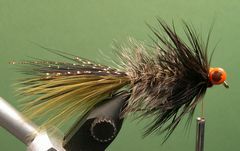 Tie in a clump of olive marabou for the tail. The tail should be slightly longer than the length of the hook. Tie a clump of black marabou on top of the olive marabou. 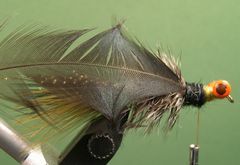 Tie in a few strands of gold Crystal Flash on top of the black marabou. Put a spool of Uni-Yarn on your materials bobbin and start it with a jam knot just behind the eyes. Make several figure-eight wraps around the eyes then make a tapered underbody back to the tail. Tie off the Uni-Yarn with a couple tight wraps of tying thread as shown in the photo. 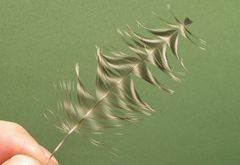 Select a webby hen neck feather and prepare it for tying in by making a notch at the tip of the feather. 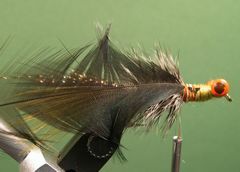 Tie in the feather by its tip at the base of the marabou tail with the cupped side of the feather facing the hook. Apply a fairly thick noodle of Hare-Tron Dubbin to the thread and dub the body to the one-third point on the hook's shank. Palmer the feather forward with fairly close wraps and tie it off. Prepare and tie in another feather just like you did the first feather. Dub the body with dubbing to the half-way mark on the hook. Palmer the second feather forward to the dubbing break at the half-way mark on the hook's shank. Prepare and tie in the third feather. Dub the body to the two-thirds mark on the hook's shank. Palmer the feather forward and tie it off. At this point you should be at about the two-thirds mark on the hook's shank. Select, prepare, and tie in a black feather by the tip just like you did the other feathers. Apply a fairly thick noodle of black dubbing to the thread and dub the remainder of the body up to the eyes. Palmer the black feather forward and tie it off. You may need a second black feather to finish the process. If that's the case, simply repeat what you did in step 15. Apply a thin noodle of black dubbing to the thread and figure-eight the dubbed thread around the eyes until you have a pronounced dubbed head. Form a neat thread head in front of the eyes and tie off the thread. 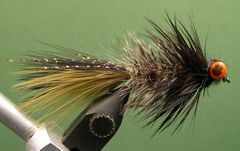 Brush the fly with a dubbing brush to marry the hackle fibers with the dubbed underbody. If you would like to learn how to make a Dubbing Brush, click on Dubbing Brush. Your Soft-Hackle Bi-Bugger is finished.